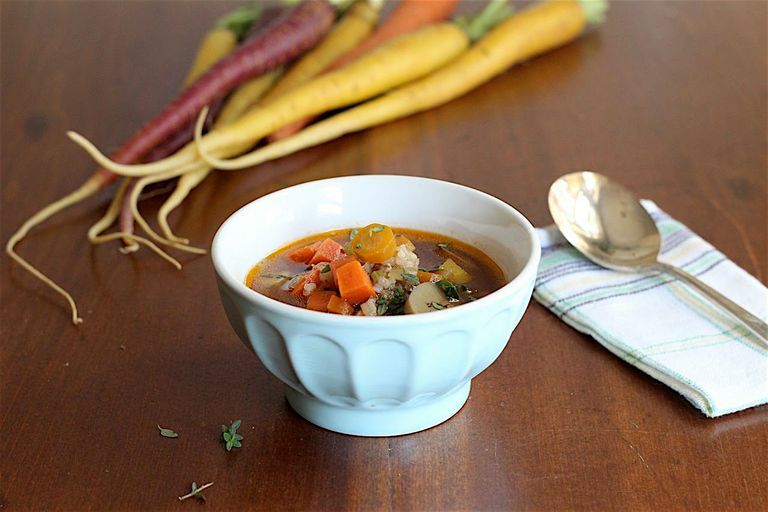 This hearty soup is reminiscent of beef and barley soup, as short grain brown rice has a similar appearance and chewy texture to barley. The timing suggested for this recipe assures that each ingredient is perfectly cooked and tender when the soup is done! Fresh button mushrooms are high in FODMAPs, but fortunately, canned mushrooms are not. As they rest in the canning water during storage, the mannitol in the mushrooms soaks out and it is discarded when you drain the mushrooms. In a 4-quart stockpot or Dutch oven over medium heat, heat the oil and garlic together until the garlic begins to brown. Remove the garlic and discard. Add the celery and carrots and stir-fry them until they are lightly brown. Using a slotted spoon, remove the vegetables to a plate. Add the whole piece of meat to the pot and brown it for about 5 minutes on each side. Remove the meat to a cutting board. Pour the broth into the stock pot and scrape the bottom with a spatula to deglaze it. Stir in the thyme leaves, paprika, pepper, and tomato paste. Cut the meat into 3/4-inch cubes and return it to the pot, along with any juices that have formed. Cover the pot and cook at a very light simmer for about 40 minutes. Add the brown rice and continue to simmer for 20 minutes. Add the mushrooms and reserved vegetables along with their juices. Simmer 30 more minutes, then serve. Half a teaspoon dried thyme can be substituted for fresh thyme leaves. Beef chuck meat is ideal for soups and stews; if you are unable to buy a nice thick chuck steak for this recipe, buy a chuck roast and ask the butcher to cut it into two thick slabs for you. Pre-cut "stew meat" can also be used, saving a step, but you won't know what cut of meat you are purchasing and it may not be as juicy and tender as chuck.